Be like Cap! 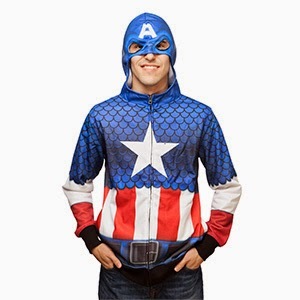 Grab this costume hoodie, which was originally priced at $49.99 for only $17.49 + 4.5% cashback in ebates. PLUS, if you purchase other things to bring your total up to $50 at ThinkGeek, you can take an extra $10 off. Here’s how to get it. Start at Ebates.com* to pick up 4.5% cashback ON TOP of the already low price. Slide on over to Thinkgeek and use coupon code “WEARIT” (30% off all Apparel today) on top of the already discounted price. Add $50 worth of gear to your card, and you can also use “RTMAYNOT” to stack an additional $10 off $50 bargain.